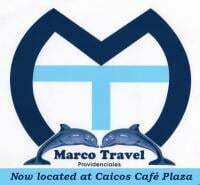 Marco Travel: From what I’ve gathered from your Facebook page and website, you were born in Austria, spent a lot of time in Styria growing up and come from a family of sports enthusiasts, with a particular interest in cycling. 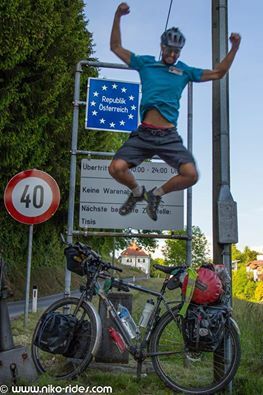 You went on your first multi-day cycling adventure with your parents at the age of 13. 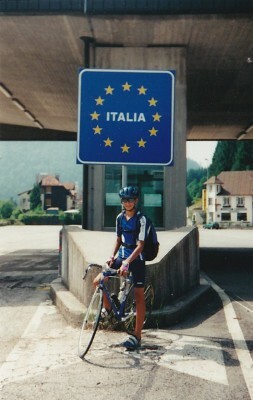 Was it that trip to Italy that sparked your interest and fascination with cycling? Niko Krauland: I did also some shorter trips with my parents and my sister when I was even younger. But the trip in Italy was special. At this point I realised, that it is possible to cycle a big distance. The landscape and the climate change, that’s a great feeling. MT: You mention on your website that you have tried many different sports over the years. What were some of your favourites? MT: You also mention that you studied Sports and Geography at university in Salzburg, other countries and cultures being a long time fascination of yours. NK: I was always fascinated by other countries and different cultures. I always loved to study maps, and watch documentaries until I could explore them by myself. Now I’m teacher and I want to inspire my students. MT: When did you first come up with the idea of combining your love of travel/culture with your enthusiasm for sports and cycling? In other words, when did you get the idea to “explore the world by bike”? MT: Can you tell us a little about your journey so far? Which countries have you covered? MT: How long have you been cycling the world? NK: 17 Months. I cycled about 21 500 kilometres and spent about 1500 hours on my saddle. MT: Did you ever use other forms of transportation, e.g. trains or buses? NK: Yes I did. But I don`t count these kilometres. 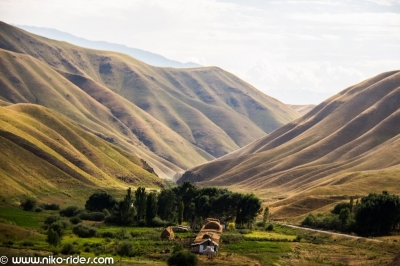 I hitchhiked for example the last 70 km into Teheran in Iran. There is just a big highway in the industrial area. No point for me to cycle there. I took the bus several times to get fast out or into a big city, instead I want to spent more time in rural areas and beautiful landscapes. 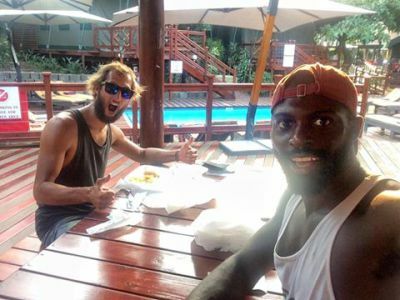 MT: I believe Mario Rigby ( Crossing Africa ) mentioned that you were on the last leg of your journey when you two met in South Africa. Is that correct? NK: Yes I met Mario the first time in a small hostel in South Africa. And then just a few days later in St.Lucia. I had to rest because I was sick. We had a great time, I think between people how travel in a different way like we do, is a special connection. I wish him all the best for his huge project to walk through Africa, he’s a great guy. MT: I can see by your website that you’re also a very talented photographer. When did your interest in photography begin and has it always been tied to travel? NK: I started with photography about 7 years ago. Mostly while travelling. I just try a lot and while you’re on the road you have a lot of time, especially when you travel alone. Sometimes it took one hour to get the perfect shot for example the sky by night. MT: Have you branched out into any other forms of media? NK: I also took videos and made short movies from every country. It nothing special, I just want to show how live is on the road. MT: What kind of gear do you use? NK: Bicycle - I had a KTM Life Lontano P1.18. KTM is a great Austrian Company who made a special Long-distance Touring bike. It has a steal frame and is very strong. All the components are special made for long distances, bad roads and heavy luggage. The Pinion shifting system is a great gearbox which you don’t have to service a lot. Just change oil after 7-10 thousand kilometres. MT: Other gear? 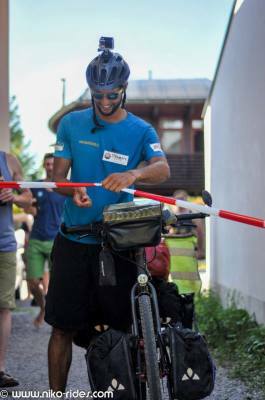 – Portable pump, tire-repair kit etc..
NK: I carried everything to fix tires, breaks, wires etc. If you have a problem in the middle of nowhere you have to repair it by yourself. In a lot of countries it is not even possible to find a good bike-shop. 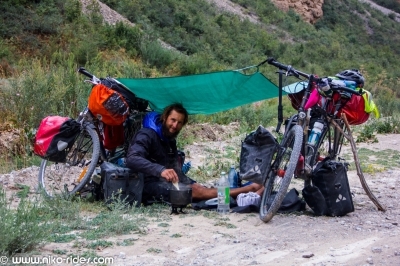 MT: Bags/luggage/tent etc – how do you carry it all on your bicycle and how do you decide what the bare essentials are? NK: I had 2 bags in the front with stove, pots and first-aid-kit, spare parts and all the food. Sometimes I had to carry food for the next 4 days. In the 2 bags on the back rack I had all my clothes, tablet and electronic stuff. In the big bag on the top of the back rack I carried my tent, sleeping bag, mattress and spare Tires and tubes. In the small handlebar bag I had my DSLR plus filters, GoPro and important stuff like passport and wallet. MT: Did you bring any special clothing? MT: Is there anything that you didn’t bring but wish you had? NK: I had too much :) , but weight is not so important. I even carried an Italian Espresso maker, or a big African Mask as a souvenir. MT: Do you travel with basic medical supplies or equipment – e.g a water purification system? NK: I had a first-aid-kid and some antibiotics. I also had a water purification system. In a lot of countries it’s impossible to get clean water. NK: Before I started my trip I went to several companies, told them about my journey, what I will do, what I can give them, and what they can do for me. I told them about my last trips, so they saw that I am not joking and that I know what I am doing. I found some sponsors for equipment. Otherwise I couldn’t afford this trip. You have to give your sponsors something. For example Feedback about the bicycle. I cycled with a prototype, which was great! I also got clothes; for sponsors pictures are very important. MT: What sponsored gear did you use? NK: The bicycle was sponsored and my clothes. It was great to have high quality stuff. MT: How long did you spend organizing everything? NK: I was planning my route for many years, but in the end it came completely different. I wanted to cycle in Japan, New Zealand and North America. But I changed my mind because of weather conditions and interests and mood. I always booked the flights just 2 weeks before I left. I never planned to cycle in Africa for example. But you meet so many nice people who tell you something great about countries. The possibility To go wherever you want to anytime is the greatest gift. MT: Is there anyone in particular that has inspired you? NK: It all started with the stories from my dad. He did some trip in Europe when he was young. Later a friend from my town cycled to India. MT: Are there any adventurers/explorers old or contemporary that you look up to or admire? NK: Heinz Stücke, a German who was on the road for more than 50 years. 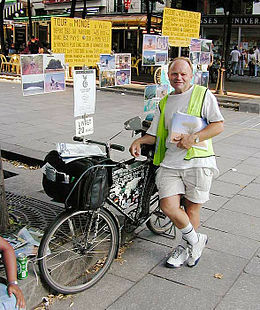 NK: A book called “ich radle um die Welt” (I cycle around the world) by Heinz Helfgen. The book is from 1954 and a friend found it at a flea market. To cycle th world at this time must have been crazy. MT: Do you listen to music while biking? Any particular music that helps keep you going and motivated? NK: Most of the time I listen to music. I had special music to wake up in the morning, to push in the afternoon and to cool down in the evening. Ratatat was a great music for cycling. 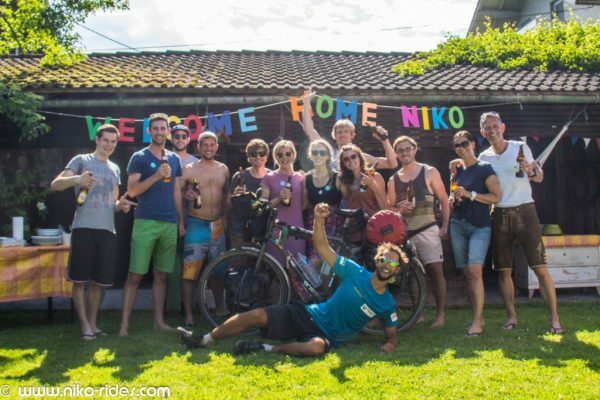 NK: When I cycled I had a lot of time to think about my next projects. It must be amazing to paddle down a big river and visit small villages which you can only reach by the waterway. MT: Is there anything else you’d like to add to the article? Is there anything you’d like to share with readers? NK: The best thing about cycling is that you never know where you will be in the evening, where you will sleep and who you will meet. I called it “the daily surprises” because there will happen every single day something new, something special. Someone invites you to sleep at his place, you meet an interesting person who inspires you, or you are just completely alone in an amazing landscape and the bird who flies above you is watching you.